Do you dream of a modern family home with a large garden offering space and privacy, in the parish of Farnham Royal? If your house hunt criteria includes five bedrooms (three with en-suite bathrooms), two reception rooms, a study, and a large kitchen and family room, all in an exclusive gated development with each home benefitting from substantial parking thanks to a double garage, car port and plenty of additional parking spaces – look no further! We are taking early viewings, by appointment only, of our Crown Gardens development of four magnificent family homes. Situated off Crown Lane in an idyllic location, these spacious properties are finished to the highest specification and boast secluded gardens in plot sizes each in excess of 0.3 acres. If you’re not familiar with Farnham Royal and neighbouring towns and villages, the area is perfect for families. The vibrant villages of Farnham Common, Burnham and Farnham Royal are within minutes of Crown Gardens, and provide excellent local amenities for shopping and leisure activities. 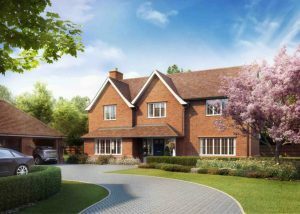 The market towns of Beaconsfield and Gerrards Cross are also a short distance from the development. Families with school-aged children are well catered for; there is a choice of good and outstanding local schools for primary and secondary education, as well as colleges for school leavers. There are also a number of local nursery schools and a Montessori within 10 minutes drive. Weekends and school holidays can be filled with activities, with plenty of local sports clubs and excellent facilities close by. 500 acres of protected nature reserve at Burnham Beeches and Stoke Common provide space to let off steam with trails for dog walking, cycling and exploring. If this sounds like idyllic country living, but you also want easy access to the bright lights of the capital, that’s another tick mark against your ‘must haves’! From Burnham Station you can reach London Paddington in less than 40 minutes and with Crossrail opening in December 2019 journey times will be reduced. Access to the motorway network is also straightforward, the M4 and M40 are just a short drive away allowing for a quick getaway if heading north, east, south or west. As you can imagine the Farnham Royal area is popular with commuters offering easy access to London, Reading and other economic hubs. But most of all, it offers a fantastic lifestyle for families with everything on your doorstep. Not many new developments provide the internal and external space families desire. Often you have to compromise on the garden to get a five bedroom family home. That’s not the case with Crown Gardens! Each of the four family homes has a substantial secluded garden, and spacious living accommodation. They also have double garage, car port and ample parking. High ceilings, feature windows, bi-fold doors onto the garden, fireplace and log burner all add to the appeal of these beautiful homes. Lots of thought has gone into every aspect of the design and finish of Crown Gardens, and the development overall. Each property provides homeowners with space and privacy, and the security afforded in an exclusive gated development. What’s the catch? There are only four properties for sale! We know that there is high demand for homes of this size and quality, and therefore we are offering you the opportunity to get in early and arrange an exclusive viewing now. To arrange a viewing, or to find out more, contact the sales agents Hamptons on 01494 685140 or email hamptonsnewhomes@hamptons-int.com. You can also download our Crown Gardens brochure here to find out more on this luxury development of new homes.